JAMESTOWN: At a special awards dinner at the Marvin House, Zonta club of Jamestown named Terry Havens-Turner, Veronica Mack and Toni DeAngelo the Women in Leadership for 2017. A graduate of Cornell University, Terry Havens-Turner is the Corporate Treasurer/Secretary for the Matric Group. Terry has extensive community involvement with organizations and companies including: Creche, Chautauqua Lake Association, Chautauqua Lake Yacht Club, UPMC Chautauqua WCA Hospital and Warner Home. She currently sits on the boards of the Chautauqua Lake Association, Lutheran Social Services, Lakewood Community Development Foundation the Chautauqua Lake Yacht Club and is a founding member of the Southwestern Schools Educational Foundation. 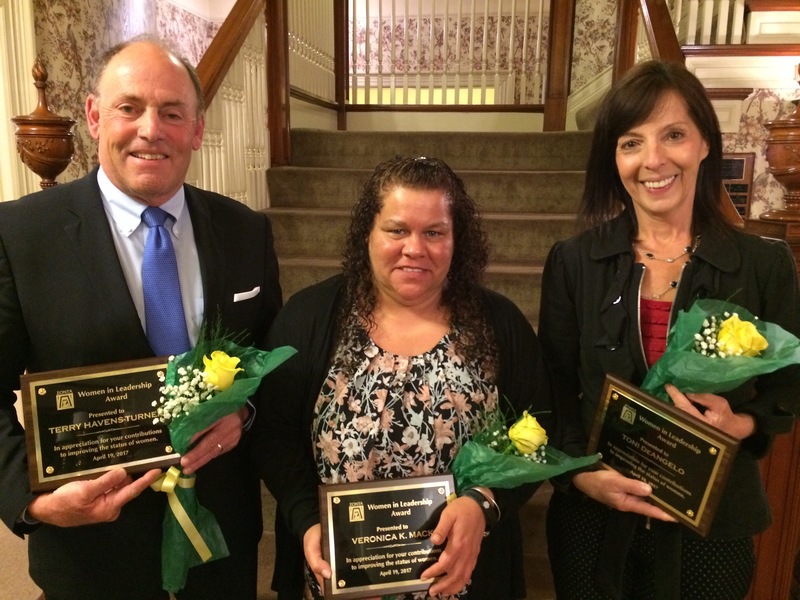 Terry is married to Rick E. Turner Jr. who received the plaque and yellow rose in her absence. Their son Ricky and his wife Heather attended the dinner in support of her award. Terry has another son, Bradley Turner and daughter, Lauren Turner who were unable to attend. Veronica is a Licensed Clinical Social Worker in New York State. She received her Masters in Social Work from the University at Buffalo. Veronica earned a certificate in Child and Adolescent Informed Trauma Treatment while working at Randolph Children’s Home and she is a member of the National Association of Social Work. Veronica currently works as a Licensed Clinical Social Worker at The Chautauqua Center and has worked as a Family and Individual Social Work and Trauma Therapist at the Randolph Children’s Home, as well as a Mental Health Counselor at the Inpatient Adolescent Mental Health unit at WCA Hospital. She has been a School Social Worker for the TEAM Program, and a Mental Health Clinician at Jamestown High School through The Resource Center. Veronica’s education and work support her extensive community involvement with a self esteem step group, her involvement in organizing the march against school violence, a speaker on the domestic violence impact panel, co-facilitator of teen health awareness program through the TEAM Program, Youth Mentoring and has supervised internships for young women at the Associates, Bachelor, and Masters level in college. Veronica has two children Casee and Jordan and two grandchildren Jayden and AnDraya. Toni DeAngelo is a Registered Nurse, and Community Health and Wellness Director, at UPMC Chautauqua WCA. Toni is a 1984 Graduate of JCC’s Registered Nursing program, is a Tobacco Cessation Specialist, Certified Lactation Consultant and Certified Patient Navigator for Cancer Care. Toni’s education specialty is with Health Education and Disease Prevention. Ms. DeAngelo started working for the hospital in 1980. She’s worked in specialty areas including Dialysis, Cardiology, the Intensive Care Unit and Wellness. Although she retired in August 2016, Toni continues to work 10 hours a week at UPMC Chautauqua WCA and as a Grandma. Involved in Chautauqua county community outreach and county planning teams, Toni helps with the Women and Infant Health, Cancer Care, Women and Heart Disease and the Baby and Me Tobacco Free cessation programs. Toni has two daughters, Natalie and Joanna; Two grand-daughters Cecily and Mia and a grandson due in August. Every year the Zonta Club of Jamestown selects and names women from the community as “Women in Leadership.” These are women who fulfill the Zonta mission of ’empowering women through service and advocacy’ in a non-member role. For more information visit ZontaJamestown.org. Pictured: Kelly Emerson and Amanda Miraglia at the Marvin House in Jamestown. 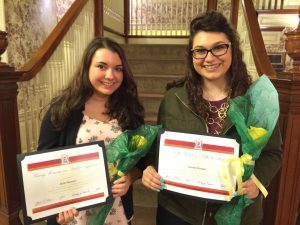 JAMESTOWN: Zonta Club of Jamestown proudly announced the local 2017 scholarship and award winners at a special dinner held April 19. Amanda Miraglia, Kelly Emerson and Lauren Hendrick where were all recipients. The Nell Newton was a charter member of the Zonta Club of Jamestown which started November, 17, 1921. During her years in Zonta, Nell held a variety of offices including President of the club in 1922-23 and assisted in the formation of four new area Zonta Clubs. Upon her death, a scholarship was established at Jamestown Business College for a woman who was preparing for a career in business. Amanda Miraglia is the recipient of the 2017 Nell Newton Scholarship. Amanda will be graduating from Jamestown High School and will be attending Jamestown Business College where she will pursue her bachelor’s degree in marketing and management. She would like to open her own business with her mother. Amanda is member of Key Club, volunteers at St. James Church, Salvation Army and CC. Ring Elementary School, and has received a scholarship to JBC for good grades. Amanda has also worked at Wegman’s for three years while attending high school. The Young Women in Public Affairs Award is an award to encourage young women to pursue careers or seek leadership positions in public policy making, government, and volunteer organizations and further their education with these aims in mind. The recipient must be actively committed to volunteerism, have experience in local or student government, exhibit volunteer leadership achievements and advocate to the mission of advancing the status of women. Kelly Emerson is the recipient of the Young Women in Public Affairs Award and will be graduating from Jamestown High School in June. Kelly is a member of the JHS Varsity Tennis Team, Key Club, National Honor Society, Student Government, and Ski Club. Kelly has participated in Key Leader retreats at her school, and volunteered with Kallie’s Krusade, Wings Flights of Hope, and the Alex Foulk Foundation. Miss Emerson will be attending Case Western University this fall where she will be studying biology with hopes to get into medical school and become a child psychiatrist. Mary Bargar gathered together a group of professional women to establish the Zonta Club of Jamestown which was chartered on November 17, 1921. She served as the club’s first co-President during 1921-1922 and also served as President during 1929-30. Mary continued to serve in various capacities during her years with Zonta. Mary was educated as a teacher; however, her last professional position was as the Jamestown City Clerk. Upon her death, a scholarship was established at Jamestown Community College for a woman who was attending college to become an educator. The requirements for this scholarship have changed over the years, but the intent of supporting professional women remains the same. Lauren Hendrick is from Bemus Point NY and will be graduating from Maple Grove High School. Lauren is the recipient of the Mary Bargar Scholarship. Lauren is a member of the National Honor Society, Student Council. Class Officer, Competitive Cheerleading, and the School Musical. She received the Chautauqua Area Scholarship Program Academic Award and was the third runner up in the program. She has received the principal’s academic achievement award and has been on the maple grove honor roll all 4 semesters and the JCC Dean’s list. 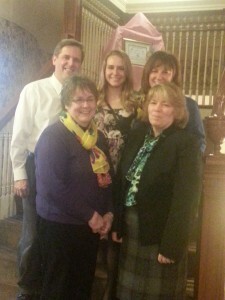 Lauren has volunteered with Footsteps of Chautauqua County and at Heritage Green as an activities assistant. She has worked for the past three summer as a Barista at Wired on Main in Bemus Point. 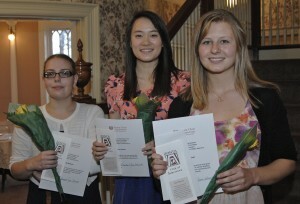 Zonta Club awards several $1,000 scholarships every year to local female students and women returning to school. For more information on Zonta and the mission to empower women through service and advocacy, visit ZontaJamestown.org. 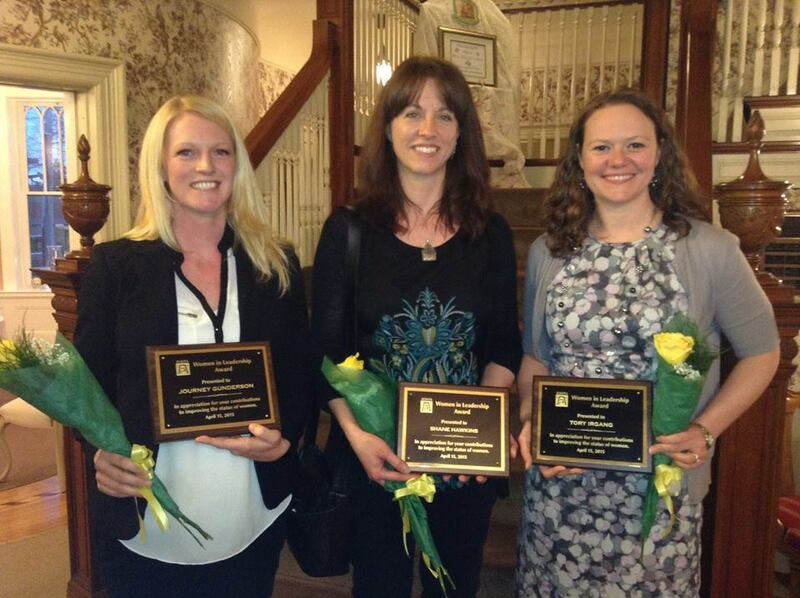 SO PROUD to Announce our 2015 Women in Leadership Award Honorees: Journey Gunderson, Shane Hawkins and Tory Irgang. These three women are professional, progressive and strong leaders in their executive roles. They have each brought about ground-breaking successes and exemplify the Zonta mission of empowering women through service and advocacy. We are so happy to have them here – working to better our community. 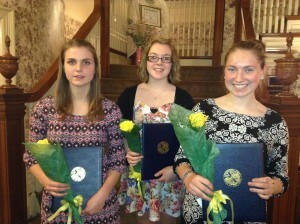 CONGRATULATIONS TO: Hope Zielinski, Laiken Biekert and Abbey Andrews. The 2015 Zonta Club of Jamestown Scholarship & Award Winners! JAMESTOWN: The Zonta Club of Jamestown has awarded scholarships to 4 local students at their April 15th Awards presentations. The Mary Bargar Scholarship of $1,000 was presented to Laiken Biekert from Chautauqua lake School. She plans to attend JCC and is pursuing a career as a nurse midwife. Laiken is an excellent student, works during the summers and finds time to mentor other students. The Young Woman in Public Affairs Award was presented to Abbey Andrews from Southwestern school. Abbey has gone on several mission trips through her church. The latest of which was to Portugal. Abbey is an excellent student and is very active in local volunteering including the mentoring of other young women. Her essay was about ending child marriage, which limits young women around the world from reaching their potential. She plans to pursue a degree in education to serve people with limited access to educational opportunities. The Nell Newton Scholarship was presented to Hope Zielinski from Cassadaga Valley Central School. Hope works at Heritage Village while completing her high school education. She is involved in many volunteer and extra curricular activities including tutoring other students and still managing to maintain excellent grades. She has a knack for mathematics so plans to attend SUNY Fredonia to become a certified public accountant. And the Verna Nelson Scholarship for $1,000 was awarded to Emily Smith who is attending St John Fisher College in Rochester NY. She will graduate in May with a double major in Childhood and Special Education and she hope to teach elementary school. The club was very pleased to receive these young ladies on the same night as their “Women in Leadership” Awards presentations so they could hear the inspirational speeches given by women who have established themselves in their careers as strong, valued leaders in our community. Proud parents Sean and Teri stand with scholarship recipient, Christine Seibert. Awards Committee chairs Roz Newton and Jean Schrader (front row Left and Right respectively). Courtney Linnecke, recipient of the Verna Nelson scholarship, is a graduate of Chautauqua Lake Central School and currently a junior at the State University of New York at Geneseo. She is double majoring in English writing and international relations, with a minor in the honors college. Besides coursework, she is a member of the women’s club ice hockey team, the Geneseo Organization for Deaf Awareness, the Newman Catholic Campus Ministries, the Phi Eta Sigma National Honor Society, and the student newspaper The Lamron. She also tutors for the Access Opportunity Program and works part-time at a local art gallery. Courtney has accepted an internship this summer as a reporter for the Chautauqua Daily newspaper in the Chautauqua Institution. In the fall she hopes to study abroad for a semester at the National University of Ireland at Galway, and then graduate in the spring of 2015. Upon graduation, she plans to do a couple years of service work abroad before returning home to either pursue a career with her writing or to work for a non-governmental organization. Lori Pumford, recipient of one of two Anne Crowe scholarships, has a Bachelor’s degree in biology from Grove City College (1998) and was inducted into Phi Theta Kappa, a two year college honor society, in spring 2013. She is completing her second semester of JCC’s nursing program, is active in her children’s school activities and since 2010 has run four half-marathons. Besides school and family responsibilities, she also works as a server at Applebee’s! Our other Anne Crowe Scholarship winner is Jeanette Swanson. With setting an example of furthering education to make a better life for herself and her children as her motivation to return to school, Jeanette is completing her first year of JCC’s Occupational Therapy Assistant program. Our Mary Bargar Scholarship was awarded to Christine Seibert. She is a senior at Cassadaga Valley Central School and will graduate as valedictorian. She has been a member of the National Honor Society for 2 years and was named to the 1stTeam All Star Volleyball this year. She has helped serve at the Kiwanis Club functions as a member of the Cassadaga Valley Key Club. Her plans are to attend college to become a doctor of physical therapy. Our second Mary Bargar recipient was Corrine Cardinale. A senior at Southwestern Central School, she will be attending SUNY Buffalo and majoring in history. Corrine has been active in Varsity Tennis, Media Club, National Honor Society, Empire Girls’ State, Class Government, and as the Distinguished Young Woman of the Lakewood Area 2014. Next fall, she will be a member of the Academies College; which will allow her to continue community service work and mentoring of students around the city of Buffalo. She wishes to continue on to Law School and become a Civil Rights Attorney, and maybe even a District Attorney. 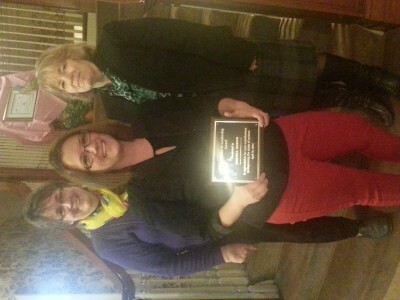 The annual “Woman in Leadership Award” for 2014 was presented to Amanda Duddey Gesing of Jamestown. 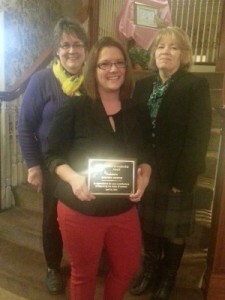 Amanda is the Director of Advocacy for Chautauqua County Striders Mentoring Program. She was chosen by the club due to her exemplary leadership in her new role and as a support for Mentors and Mentees in the Striders program. Congratulations to all the Scholarship and Award winners for 2014 from the Zonta Club of Jamestown! Zonta Club of Jamestown is one of over 1200 chapters of Zonta International, a worldwide service organization of executives in business and the professions, working together to advance the status of women. Zonta Club raises funds and carries out service projects to benefit its community, the country, and the world. For more information about Zonta International and the Zonta Club of Jamestown, visit the Zonta International website at www.zonta.org or the Zonta Club of Jamestown website at www.zontajamestown.org. Shelby Melquist is the 2013 recipient of the Nell Newton Scholarship. Shelby, a student at Jamestown High School is a Co-Treasurer for National Honor Society; Does peer tutoring; and volunteers at the Marvin Community House. Shelby plans to attend JCC studying accounting. Emily Indriolo, recipient of the 2013 Mary Bargar Scholarship, also attends Jamestown High School and is a Co-VP for national Honor Society, Acappella Choir, Soccer, concert orchestra Treasurer; All-State Choir in 2012; all while working at Wegman’s as a cashier 20 hours/week. Emily has done volunteer work at St. John’s church and Fletcher Elementary School. Her plans are to attend RIT, majoring in biology and taking music courses. Emily’s goal is to become a physician. Caitlin Wuebbolt is the recipient of the Young Women In Public Affairs Award. Currently attending Southwestern, Caitlin spent one year in Argentina as a study abroad program, plays on the basketball and gold teams, is a National Honor Society member and has worked for Community Eye Care Specialists. She has expressed a desire to pursue a career in International Agriculture and Rural Development. The Zonta Club of Jamestown is a service organization of executives and professionals seeking to advance the status of women locally and world-wide. Zonta International has clubs in over 67 countries across the globe, and over 33,000 members. For more information about Zonta visit www.zontajamestown.org or Zonta International at www.zonta.org. For information about membership in Jamestown contact Shauna Anderson, current club President, at (716) 386-7802. Picture taken at the Marvin House in Jamestown when they joined the club for dinner and introduce themselves at a dinner meeting April 17th, 2013.